Note: The video above shows an older version of Silvertrac, but all of the same steps still apply. Automatically send a Daily Activity Report to your client as soon as the officer's shift ends. Automatically send a Daily Activity report to your supervisor so they can verify the report before forwarding to your client. Input a Report Name. The report name is what will show in the subject line in the recipients email. The Report Description is what will show in the body of the email. Select the Property for this report OR select a Group of properties for this report. Select the Time you would like the report to be sent. NOTE: This report will pull for the last 24 hours from the report time you select. For example, if you select 8am the report will include 24 hours of information from 8am today back to 8am yesterday. Select the Days of the Week you would like the report sent on. Select the Issue Types you would like included on the report. Select the Issue Levels you would like included on the report. Select the Urgent or Non Urgent issues you would like included on the report. 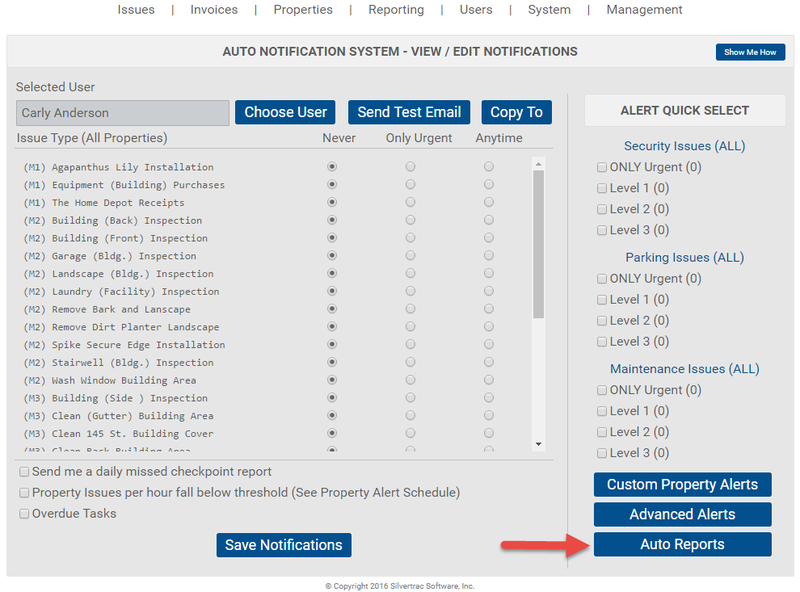 In order to receive automated reports there must be an email set up for the user. Click here to learn how to edit a user. You'll want to make sure that your email settings have been configured in the system configuration section. Click here to check your settings. Customer users cannot set up automated reports. 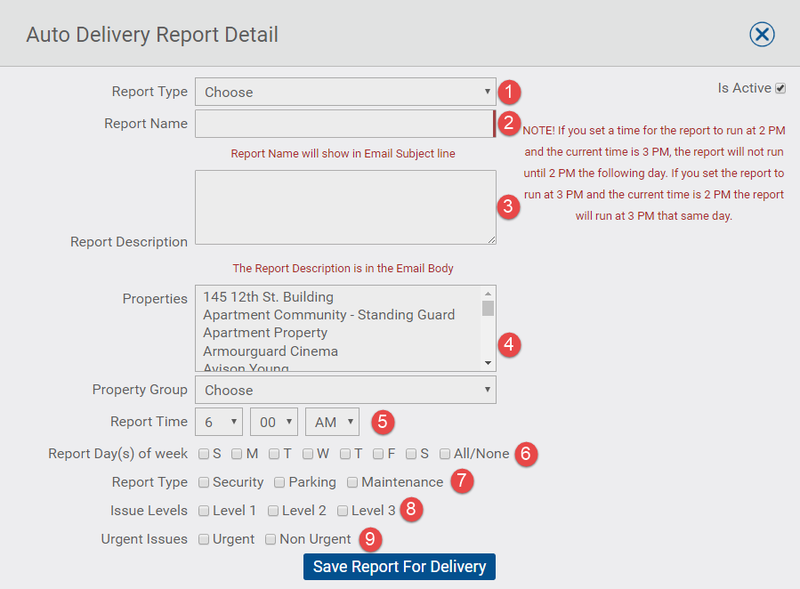 Only users with Dispatch, Supervisor, or Admin permissions will be able to set up the reports. You can, however, set up automated reports for your customers. The report parameters (like issue level or issue types) may not have and reported information for that time period. For example, if your report is pulling for only level one security issues and no level one security issues occurred, the report will be blank. There was no activity at all. If you are pulling for all activity (levels 1,2,3 and all security, maintenance, and parking issues) and you are still receiving a blank report, there was no activity reported within that time frame.